Using annual grasses in containers and the mixed perennial border is a hip new trend finally filtering up here to the backwoods, and I love it. 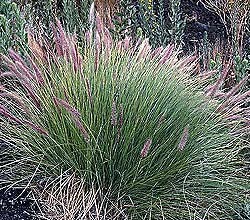 The big hitter in vogue the past few years is Pennisetum setaceum, or purple-leaved fountain grass, which comes in several varieties. ‘Red Riding Hood’ is my favorite; it’s hard to pass a large container arrangement created with any bit of elan that doesn’t include it as the centerpiece. Leaves, stems and seed heads are a rich burgundy color, but yielding to the 18- to 30-inch range, it stays erect and doesn’t get all floppy. That was your brain, not mine. 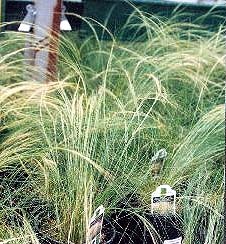 Eragrostis spp., or China love grass, is even smaller and works well at the front of the border or in smaller containers, or as a texture additive at the front or side of large ones. 12- to 18-inches, in mid-summer it fills with cloud-like seed heads of reddish-pink. Scirpus cernus, or fiber optic grass, is almost too over-the-top, but I’ve decided I like it. Tiny seed heads spring from the very tips of this dwarf, well-named grass. Very cute as a single at the front of the perennial bed. Likes it moist. Stipa tenuissima, or Mexican feather grass, is a graceful, willowy grass with slender seed heads that move readily in the wind. Not the best for containers, unless a large one where it is used as a semi-trailer. Good in open areas of the garden where it can be massed. Also tolerates wet spots well. Pennisetum messiacum ‘Red Bunny Tails’ is the other fountain grass of note, reaching three feet in height with an arching habit and good reddish color. Use this in the garden surrounded by cleome, cosmos, and other airy annuals. Since these are annuals in the north, they’re cheaper than hardy tall grasses. Most of these are Zone 7 plants, with fiber optic grass hardy only to the darn near otherworldly Zone 9. All require full sun. They’re fun to play with. In containers, they can completely replace one’s need for the infamous spike plant, that thin, reedy, green thingie that nurseries plunk into the center of their terra cotta-colored plastic containers, and then surround with red geraniums. Ugh. Call around until you find nurseries in your area that are in on the trend. 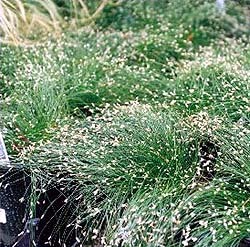 Annual grasses are a great new addition to our short-season hopes and dreams.